Since early August, the country’s eyes have been fixed on a small St. Louis suburb. When the grand jury’s decision to not indict was announced, I waited anxiously for the promised document dump by the prosecutor’s office. I wanted to see what the grand jury saw. Once the documents were released, I began reading through them. One of my initial reactions, which other commentators have pointed out (including how different this grand jury was compared to Justice Scalia’s description of the grand jury process in 1992’s US v. Williams), was the apparent grilling of witnesses with story’s contrary to Officer Wilson’s and the casual, non-confrontational questioning of both Wilson and the witnesses who supported him. As I read through the documents, I thought, “you could get an indictment here.” We have an officer shooting an unarmed man who the officer more or less believed was unarmed. We then have conflicting stories as to who escalated and what happened in the final moments. These conflicts are what a jury at trial would resolve. But on the basic facts that an officer shot an unarmed man and we have conflicting testimony as to how much of a threat the suspect posed to the officer, an indictment for SOME charge should be likely. But even if there was an indictment, could the prosecutor’s office secure a conviction? It seems unlikely. Based on Graham, we essentially have to take Officer Wilson’s description of his state of mind at his word. And with that standard, I don’t think you can convict beyond a reasonable doubt. Think about that: An officer shot a man who was unarmed, and the officer essentially knew the man was unarmed, but under existing law he probably could not be convicted. There’s a problem with the law when that’s the reality. This is not to say that Michael Brown was clearly in the right in this situation or that because he was a “good kid” who was about to go to college this is suddenly a tragic event. First, there’s a very real counter narrative that Brown was someone who just committed robbery and assaulted an officer. But this does not mean he was suddenly “bad”–it’s difficult to judge a person’s entire character based on a few isolated events. More importantly, merely being in the right or the wrong or being “good” or “bad” should not be the marker of who does and who does not have the right to live. If a citizen is unarmed, and the officer is relatively sure that he is unarmed (while Wilson never frisked Brown, he also said in his statement that Brown’s hands were empty; it up for debate whether Brown’s hand was reaching into his waistband just before the fatal shots were fired or if they were out at his sides), why should the use of lethal force be justified when there are so many more options? That’s also not to say that Officer Wilson or police in general should be hamstrung in defending themselves from threats. I was fortunate enough to go through a day at police academy several years ago with the LAPD when I was working with the office of Mayor Villaraigosa. One of the trainings they ran us through was a video simulation of when it is proper to use your gun in the line of duty. We ran through various scenarios–someone tries to carjack you, you respond to a call, you respond to a suspected terrorist threat, and so on. Going through these scenarios, you A) understood how strict the protocols are for when you can and can not brandish your weapon and B) how easy it is, in an instant, to mistake some other object for a gun, especially if movements are sudden. Being a police officer is an extremely stressful and difficult job. I’ve spoken with officers who respond to late night calls in areas where they can’t entirely see their surroundings but know that someone is around the corner with a weapon, thinking that this call may be their last. In that scenario, it is easy to see where someone popping out from the woodworks may result in a knee-jerk reaction to shoot. But that was not the case in Ferguson. Michael Brown was unarmed and there was no reason to believe he had a deadly weapon. I remember the training officer repeatedly telling us to keep our weapon holstered until either we saw or knew that the suspect had a gun. That didn’t happen here. 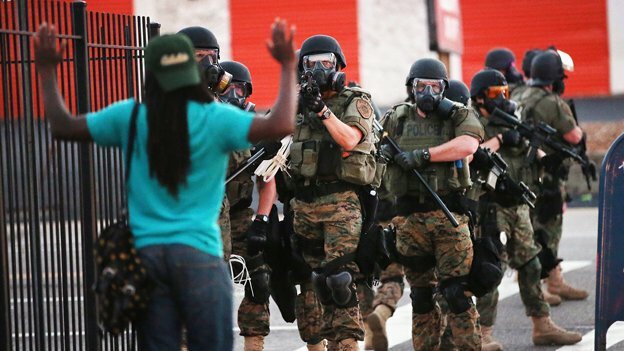 Nor was Michael Brown holding or waving some shiny object that, in an instant, Officer Wilson believed could be a gun. His hands were empty. Officer Wilson also didn’t think he was pursuing someone who had just killed multiple people. According to Officer Wilson, he thought that this MAY have been the guy who stole a few cigarillos (but the interview Wilson gave the day after the shooting states he heard the suspect was a black male in a black t-shirt, while Michael Brown was dressed in white). When you put everything together, it simply doesn’t seem right that an unarmed man who stole some cigarillos was shot and killed by law enforcement. Brown may very well have assaulted an officer. But the last time I checked, the penalty for assaulting a police officer is not death. Had he been apprehended alive, Brown would have likely been charged with either assault of an officer in the first degree (attempts to kill or causes/attempts to cause serious physical injury) or, more likely, assault of an officer in the second degree (causes/attempts to cause physical injury). Second degree assault can either be a Class B Felony (5-15 years in prison) or Class C Felony (max of 7 years in prison). I personally think it would be a Class C Felony here, based on 565.082 (2)’s language of “by means other than a deadly weapon or dangerous instrument,” which falls into the Class C category. All these penalties are significantly less than death. If Brown had a weapon and Office Wilson knew that if he did not shoot Brown then Brown would shoot him, we as a nation are not having this conversation. I think everyone sees that situation as clearly different. But it doesn’t seem right that Brown, being unarmed, is killed and that there isn’t even a charge of wrongdoing against the officer. Especially when compared to another officer in St. Louis, with his case handled by the same prosecutor’s office, being charged with assault for using his baton. The lesson seems to be–if you shoot an unarmed suspect and say you feared for your life, you’re in the clear, but if you do something less drastic, you may have to answer for it. If everything laid out above doesn’t quite seem right, doesn’t seem fair in a nation that prides itself on the fairness and equality of all before the law, then people will want to see change.